I’ve been researching a lens best suited for concert photography for more than a year now. In the past I never really considered using different lens for concerts but a number of things eventually factored in to my decision to at least look into the idea. In the past I’ve pretty much used the same lenses for various jobs. Since going digital I’ve owned or wordek with the Canon 10 D, 20 D, 50 D and currently work with the 7 D. My primary lenses have been the Canon 28-105 and Canon 28-135. I’ve also used the 70-200. After a few years of focusing on Portraiture I found myself shooting more and more concerts and events. At first my goal was to find a fast lens I could use in low light and in situations that prohibited flash photography. After months of research, most of which suggested the Canon 50mm USM I convinced myself to give it a try.After shooting my first couple of shows with it at Maxwells I noticed a tremendous difference in my work. Working without flash added new depth to my work and people were taking notice. 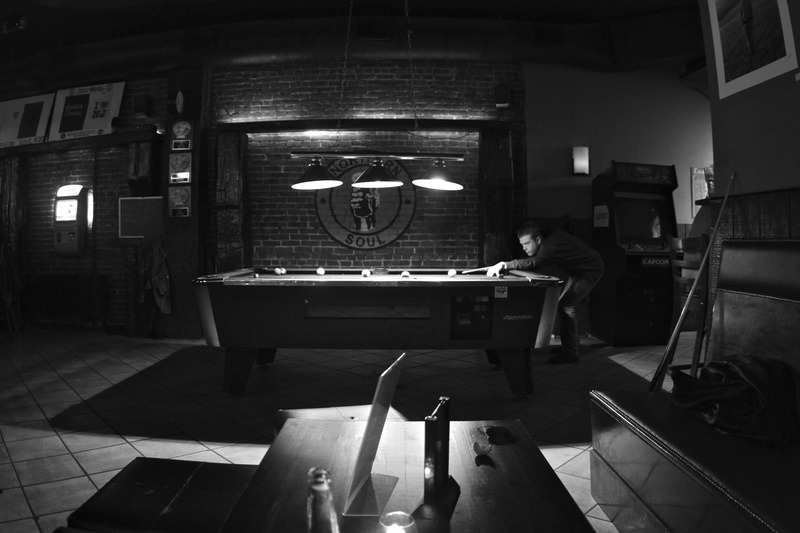 The problem was the 50mm called for really tight shots at the smaller clubs and bars I was used to working in. Most of the time I’m shooting I’m inches from the stage, mere feet from my subject. The photographers and photographs that always inspired me were the ones that depicted exaggerated wide angle views. Capturing not only the band but the emotion, feel and energy of the crowd. I know I wanted a wide angle lens but had no experience or knowledge there of. So one morning I decided to ask the best concert photographer I know, Ken Salerno. So I went to my facebook page and sent Ken a quick ask. Ken’s reply was more than I needed. He not only recommended a great lens but also gave me insight into why he is such an amazing artist. With a head full of knowledge I raced to B&H and met up with my favorite salesperson. When I mentioned the “Salerno Recommended” Canon 15mm Fisheye lens and what I’d be primarily using it for he looked up and gave me a rave review telling me he had recently shot a Matisyahu concert with it in L.A. I was sold and couldn’t wait to use it. Though I shot a bunch of images of it at home that night my first assignment came later that week when I shot some images for an article for NJ.com. Below is a shot I took at Northern Soul in Hoboken the night I was shooting for NJ.com. Side note; Upon buying the lens I was told to be careful of the glass and it’s fragile nature. Aside from the shots I took for NJ.com I’ve used it at two shows and found it to be nothing but amazing. It’s lightweight and gets great wide views. I’ve been getting within breathing distance of artists getting nice wide ranges and I’ve been able to capture the bands interaction with the crowd. I’ve also found it to be very useful shooting landscape and exaggerated portraits. My one and only issue is that I cannot go full wide with my Canon 7 D. Thus making me think I might eventually move to the 5 D.
Previous Previous post: Steph and Jennifer Make Work Fun. Next Next post: This One Time at The Court Tavern.